Outfits you need for your next getaway. Getaways are for bottomless margaritas, beautiful sunsets & exploring new places. We planned a last minute vacation to Cabo which is only a two hour flight from Los Angeles, it's close enough to go to for a tropical destination which also feels like it's so far enough to where you feel like you're in a paradise far far away from home. If you have not been there yet, add it to your bucket list ASAP! I will also do a quick recap on the trip next week! But first I could not wait to share these super cute outfits from Lulus. 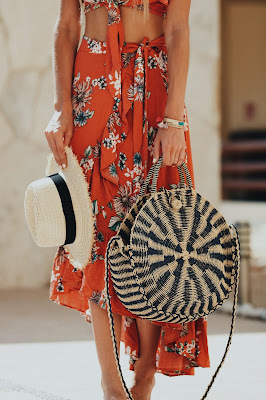 When going on a vacation I always try to pack something I have not yet worn, well this time I really stepped out of the box and added a pop of color to my vacay, thanks to Lulus! I've mentioned it before that Lulus store [online only] has been my go-to for alllll the summer pieces, whether it's a accessories or an entire outfit, they've got it all. So when I saw this super fun two piece print beauty I could not pass up on it - can you blame me ?? It's simply gorgeous and oh so fun. I always tend to pack just the right amount of outfits for each trip so today I wanted to share what I have brought to Cabo vacay. 3 dresses. Each dress had a different purpose & a very different look. First one was the blue mini dress [below], second was the two piece skirt set [above] and third was a very casual dress which I will share on Insta over the next few days. Each outfit is very different from each other as you can see, the two piece set was fun for a day out exploring the town of Cabo & dinner by the beach to watch the sunset while the one pictured on the bottom was fun for a beach day as it's light and could fit into any bag. 1 tote bag. Yes, I am that girl that hates carrying the luggage & I only carry either one bag OR one carryon with me on the trips. 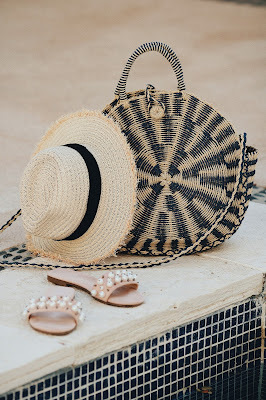 This bag pictured in this post is also from Lulus & was perfect for all the activities, beach & dinners. 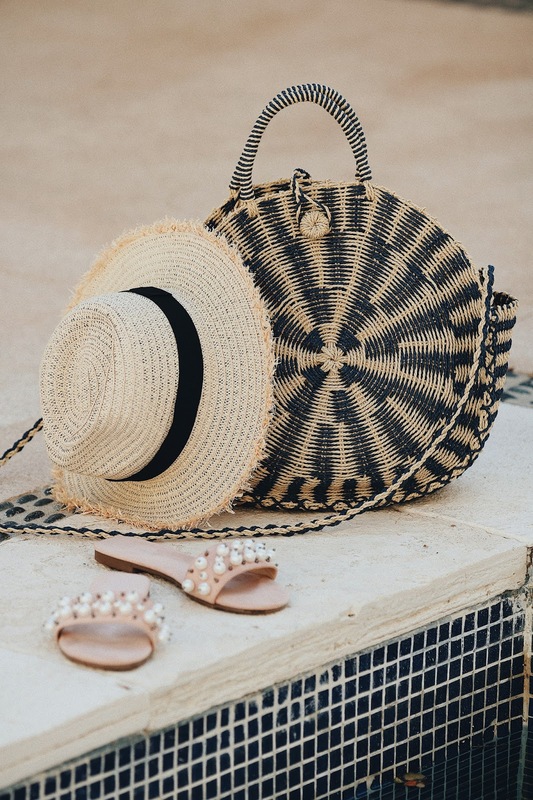 Straw bags are very "in" right now and you could not go wrong with this one as it's got it all - design & perfect size! Prepare yourself, it's literally in every photo I took in Cabo haha. 2 pairs of shoes. I have realized that the more options you bring on the trip the more time you will waste trying to decide what to wear so I only bring a few of each item to save the headache and have more time to enjoy the trip. This time I brought this super cute pair of slides with pearl detail [surprise, surprise it's also from Lulus!] along with a simple pair of lace up sandals that tie up which I will share on Insta. Tip: step out of the box and try something new, like I did! You might now that white outfits are my go-to and it's my comfort zone but this trip I decided to switch it up and go for bright, bold colors - something new and exciting & who knew I will love it this much! I absolutely love how the photos turned out and how well it played with all the tones of Cabo. Two piece set: Lulus. Buy on HERE. Straw hat: Lulus. Buy on HERE. Pearl slides: Lulus. Buy on HERE. Straw tote bag: Lulus. Buy on HERE. Tassel bracelet: Lulus. Buy on HERE. Mini dress: Lulus. Buy on HERE. Thank you Lulus for partnering with me on this post.